Things I have a hard time letting go of: control, the idea my daughter may not believe in God, the fear my husband could die and leave me, anger about having cluster headaches. Common things I hear from my clients about letting go: “I miss him”, “I don’t know how to do it any differently”, “I wish she would just stop”. To let go of people, places and things also means letting go of fruitless beliefs and ideas. Ideas like we can control others, believing the past could’ve been different or that life isn’t fair. Letting go and moving forward means being willing to accept life on life’s terms – even if it hurts. It means dealing with what is instead of living in a false state of reality. I mean hey – my husband is alive and kicking and my daughter is her own spirit. It doesn’t serve me to live in a future that hasn’t happened. 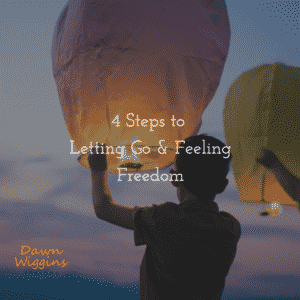 Watch the video below to learn more about how you can let go and feel freedom again, or scroll down to read the highlights. Step #1: Become familiar with the ways you are holding on. This may be rehearsing negative thoughts and feelings about the past, keeping items or looking at photos that refresh the hurt, refusing to adapt by avoiding solutions. My biggest triggers that cause me to “cling tight” are things like Facebook, the news (it’s sooooo depressing) and my memories of past pain. Step #2: Identify what you are getting out of holding on. It isn’t really helping you, but deep down inside, you feel like it is. Is it protecting you from pain, providing you a sense of control or allowing you to live in denial? Find your hypothetical pay off? For me, it’s usually the first two. I do silly things like make my husband promise to live forever or rehearse conversations with my daughter in my mind. Step #3: Make a choice. Letting go can happen one finger at a time or all at once, either way you have to decide to do it. This can happen in your mind and also in your behavior. When we follow our choice with behavior, it reinforces the choice and typically creates a beneficial experience. For instance, if the news increases my fear that my husband will die via automobile accident, zika virus or random shooting – I choose not to watch the news. And when the fearful thought enters my mind, I change the thought to something optimistic like “I am grateful for any amount of time I have with my husband”. These things are evidence of my choice to let go of an irrational fear. Step #4: Get comfortable with acceptance, meaning live in the present. When you catch your mind arguing, remind yourself that today is where you choose to be. Today may be painful, however if you avoid it, eventually it will catch up with you. I cannot control the onset of a headache, and I promise you it hurts beyond words. So acceptance means, not fighting the pain or fueling the anger, breathing through it, cancelling sessions if I need to and relying on help to care for me and my daughter. Any time I let my mind wander to dark places, the pain gets worse. Those dark places aren’t real, they are anger and fear manifesting as negative thoughts and painful feelings. Staying in the moment means not being swallowed up by pain and staying grounded in the reality that life is still happening all around me and I am OK.
As I tend to say…Letting go, like anything else, is a process. Pick one thing you want to be free from and start the process. If you want some support, call me at (561) 221-5575 or schedule your on the house consultation now!